Low Carb Chorizo Spinach Filo Cup Appetizers are light, crispy savory bites of Mexican flavor with a bit of a kick on the back-end. Take these easy appetizers to your next party and watch them leap off the party tray. These Lil bits look adorable on a tray and satisfy appetites. For a party fueled by finger food these are a good addition. Low carb Chorizo Spinach Filo Cup Appetizers are stuffed with a healthy mix of greens, peppers, cream cheese and chorizo and topped with a half pecan. I created these holiday appetizers for our Christmas party. I just picked up some Fillo cups and brained stormed in my kitchen. They came out great! 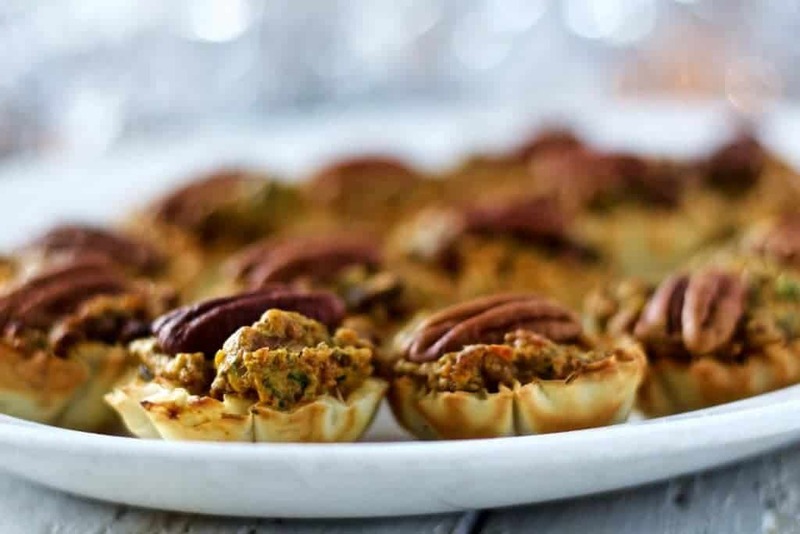 These healthy holiday appetizers are also great for parties year round. Tailgating, Super Bowl Sunday, Poker night or any ole get together these appetizers will be a welcome addition to the snack menu. You can, of course, adjust “the kick” by using lower heat peppers. Use kale, chard or other flavorful greens in place of the baby spinach if you like. The chives, garlic and basil were really flavorful in this recipe. You need to keep them. When blended together with the Chorizo, you will have a loose, orange tinged, creamy paté shot through with green and a bit of red. Very festive! Adjust the texture and color bits to your taste. As we show you on our video in the recipe card you can also hand chop the vegetables for a stronger color pop. 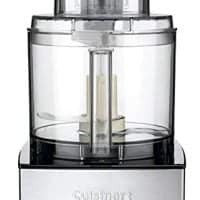 This is a REALLY easy appetizer because you can chop all the greens in your food processor and mix up the filling that way too. The Fillo cups are pre-made and pre-cooked. Find them in your frozen food Novelty section of the grocery store. 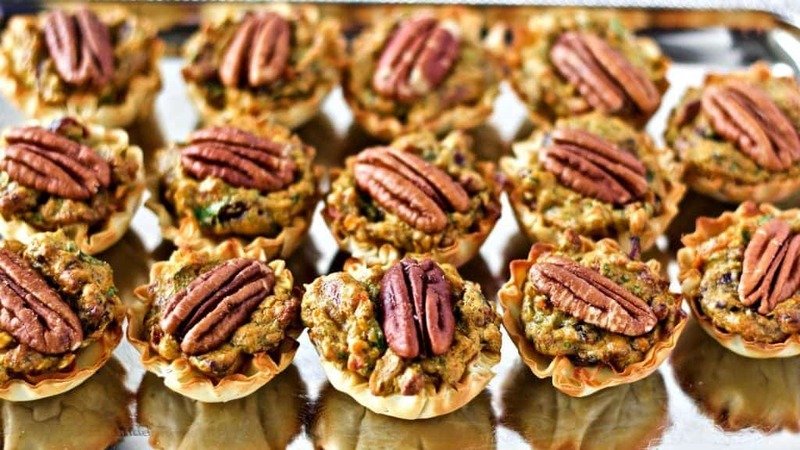 The pecans can be added either before you bake them or just after the cups come out of the oven when the filling is piping hot. Embed the pecans into the filling so they stay in, as shown. Sweet hot chili sauce is an optional garnish. I loved it, but not everybody thought it necessary. This recipe makes about 4 cups of filling, more or less, depending on how many greens you enjoy in your filling. I will say my measurements on the greens are approximate. Adjust the amounts to your own preferences. This appetizer recipe should make enough filling for 30 stuffed Fillo cups plus more. I often have extra filling. This is a great low carb party chip and veggie dip if you have extra. Can you make this recipe ahead? Yes. Make the filling ahead and store it in an airtight container for several days before serving. On serving day take it out of the fridge and let the filling warm up some so it’s easy to work with. Fill your pastry cups and bake as directed. Can you serve these appetizers at room temperature? Yes. No need to worry if these are at room temperature several hours by the time they get eaten. Can you reheat them? Yes. Prefer to keep these hot or want to reheat them next day? Warm them 20 seconds in the microwave or keep the pastry shells crispy (preferred) by reheating them on a baking sheet at 400 degrees for 10 minutes. You can freeze the filling for up to three months in an airtight freezer bag or vacuum pack. Low Carb Chorizo Spinach Fillo Cup Appetizers are Savory tasty bites with a bit of a kick on the back-end. Take these easy to make, flavorful, crowd pleasing appetizers to your next party! on medium heat cook the chorizo until well done-drain. Meanwhile chop all the greens, garlic, and peppers. Combine the cream cheese, cooked and drained chorizo and dried cranberries. mix well. 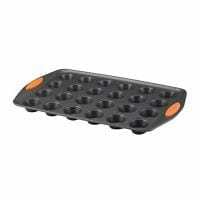 Set out the Fillo cups on to a greased baking sheet. Place one tablespoon of cream cheese mixture into each cup. Bake about 8 minutes until slightly browned. Make this recipe in your food processor to make a smooth or bumpy smooth paste filling. Otherwise, if you enjoy the texture, chop the ingredients by hand. This recipe can stretch to up to 40 chorizo bites. Nutritional information is built on using exact ingredients and portions called for in this recipe. These looks delicious. Love the combination of the ingredients. These are yummy and easy to make, Mark! Thanks so much for stopping by! Hi Richard! it’s so good to hear from you. Thank you for the great comment and rating. I hope you are doing well. Have a great day! These sounds so interesting from the savory and spicy chorizo, to the cranberry and basil addition. These are beauties! Thank you Kevin. I’m pretty sure you would love these! Beautiful and classy appetizer here, perfect for the holidays or any special occasion! Happy New Year! I just read that pecans are one of the most healthful nuts you can eat. Now I know how I’ll use them. Plus, I’ve never used Filo cups. Thanks! KC These Fillo cups are so great! 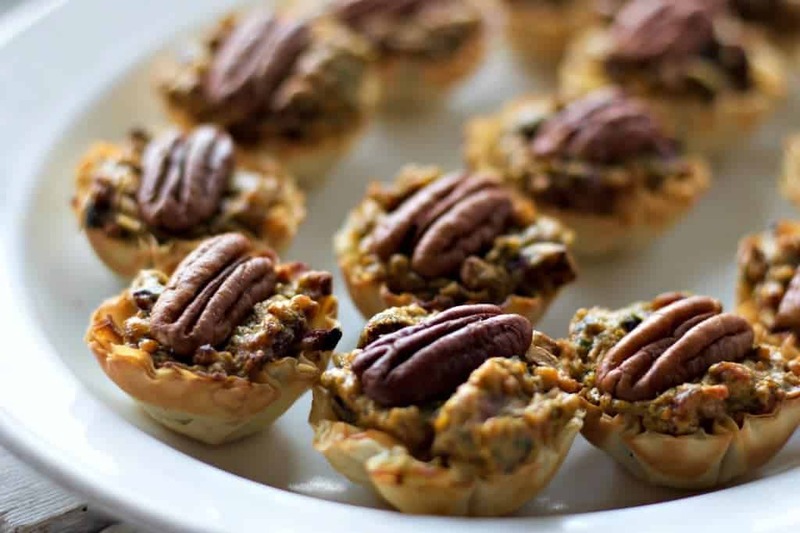 They make an easy holder for the delicious filling and add a bit of flaky crunch to the bite. Yum! Wonderful combination of flavors. Filo cups are a great base for appetizers. They are Nicky! It was so easy to make the filling, pop it into the cute lil cups and bake! 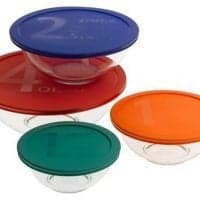 I’ve never used Fillo cups. I’m all for low carb choices – that’s for sure, and I’m headed back into eating right again. I know I feel so much better when I do. I don’t think I’ve ever seen a dish quite like this, and am quite fascinated by them, AND you’ve made a mighty beautiful plate! Thank you Marjie. These are a great party choice to keep to the low carb low sugar diet. And they are delicious! They are cute and easy Fareeha! This are adorable and look so yummy! I love little finger foods like these, they are so cute and it sounds like a great combination of flavors! I love chorizo and these sound so perfect for a party appetizer! Great job! These sound yummy and healthy. Interesting combination with peppers and cranberries. It is a funny combo, Karen, but we do love how they came out!